We have a color challenge this week over at Global Design Project challenge blog. Right out of starting gate I should confess my mistake on this challenge and ask for forgiveness. I accidentally used Crumb Cake instead of Sahara Sand on this card. My only excuse is that I had root canal the other day and I have not been feeling well. Truthfully, I am a little surprised that I was able to come up with anything at all. I wasn't expecting the level of discomfort associated with this procedure and it caught me a little off-guard. Ouch! I love this hostess stamp set and I just had to use it again before it retires at the end of May. I used an Basic Black Archival ink pad to stamp the hydrangea on Shimmery White cardstock. I used the masking technique to achieve the illusion of depth. Then I used an AquaPainter filled with water and ink refills (Calypso Coral, Night of Navy, and Crumb Cake) as my method of coloring. I trimmed a little off the side of the panel and added a bit of distressing to the edges with Early Espresso ink. I added a thin strip of decorative paper from the Pretty Petals DSP Paper Stack to a side-folding card base made with some Thick Whisper White cardstock and then added the watercolored panel. Finally, I tied three 24" pieces of Linen Thread to create the bow and added some sequins and rhinestones for a little sparkle. I hope you will check out what the other talented designers have created for this fun challenge and play along this week over at the Global Design Project Challenge Blog. This week we are CASEing the amazing Krista Frattin over at the Global Design Project challenge blog. Krista is a very talented stamper from Canada and we are on the Artisan Design Team together this year. I had the pleasure of meeting Krista in at Leadership Convention last year in Orlando. Krista's projects are amazing, but let's face it, our styles couldn't be more different. So when I saw at Krista's card there was a fair amount of panic that set in. Instead of getting too worked up about how different our styles are, I decided to embrace the basics and then go from there. Here is the card I came up with based on Krista's original inspiration card. I am not much of a pastel person when it comes to cards, but I decided to give it my best effort. I love the stripes, so that was a definite place to start. Krista also used some die cut leaves, a touch of silver, and a sweet little white bow. I opted to keep the bow, but instead of white leaves, I cut some silver foil leaves and added some white flowers. I thought the flowers needed a little color, and since I was trying to stick to a soft color pallet, I decided to sponge some Blushing Bride ink onto the flower centers with a sponge dauber. When it was all said and done, I just felt like there was something missing. I already had a few Mint Macaron leaves lying on my desk, so I thought "why not"? That was a good call, because it added a much needed touch of color to the monochromatic (and a bit boring) flower cluster. I attempted to stamp a greeting directly onto the background, but no matter how hard I tried, the unevenness of the stripes made it look crooked. So I stamped and embossed the greeting onto a strip of black cardstock and covered it up. Sometimes "mistakes" can be a good thing and I think this is one of those times. It made a huge improvement in the look of my finished project. In the end, I really love the way this card turned out. One of the best things about our challenges is that they force me to try things that I would never do on my own. Why don't you give it a try? We would love for you to join in the fun! Even if you don't play along, be sure to check out what the other talented designers/players have created at the Global Design Project Challenge Blog. #140557-Birthday Bouquet Designer Series Paper, #140272-Whisper White Thick Cardstock, #100730-Whisper White Cardstock, #121044-Basic Black cardstock, #138337-Mint Macaron Cardstock, #131172-Blushing Bride Classic Stampin' Pad, #132178-Silver Foil Sheets, #140619-Rose Garden Thinlits Dies, #140625-Botanical Builder Framelits Dies, #140764-Helping Me Grow Photopolymer Stamp Set, #102283-VersaMark Ink, #109132-White Embossing Powder, #137904 White 1-1/4" Jute Ribbon, #133773-Sponge Daubers, #139637-Iced Rhinestone Embellishments. Welcome back to another 2015-16 Stampin' Up! Artisan Design Team blog hop. We are a group of international demonstrators selected by Stampin' Up! to represent the company on our blogs and on social media. If you are already going through the hop, you should have just arrived here from visiting my incredibly talented friend, Cindy Schuster. When you leave here you will travel on to visit the amazing Inge Groot. This week we are featuring any stamp set or product we want as long as it is from our current box of goodies. You will be amazed at all the fabulous projects created by the Artisan Design Team so be sure to go all the way through the blog hop! It's no secret that I love flowers and I am so excited to finally give this stamp set some ink. Here are a few things about this card that you should know. First, I wanted to use the flower clusters separately, so I cut them in half, down the middle. These are photopolymer stamps so it is really easy to see where to cut and I can always position the pieces as they were originally designed. Second, I stamped the flowers with Basic Black ink on Shimmery White cardstock and heat embossed them with clear embossing powder. (This ink dries quickly, so you need to have your clear embossing powder ready to go.) The embossing really makes the stamping pop and it gave me some channels to help keep the ink inside the lines when coloring. It also really enhanced the black ink and made it stand out even more on that bright background. Finally, I wanted to show you just how vivid our ink refills are when you color on Shimmery White cardstock...absolutely stunning. I filled an AquaPainter with water used that to paint the images. My paper curled quite a bit with all the water I added, so I put the card front inside of a folder piece of copier paper and ironed the backside. This will melt some of the embossing powder, so be sure to put something over it or you will have a BIG MESS! I am really loving this technique and I can't believe it has taken me this long to embrace it. I had to resist the urge to add too many embellishments. I wanted this card to be able to go through the mail easily, so I kept the thickness at a minimum. I could have even left off the bow, but you know how I love to add twine to my cards! The Artisan Design Team will be hopping again in a few weeks, so be sure to check back often. Inge Groot is next on our blog hop so be sure to head on over and check out what she and the the rest of the Artisan Design Team team have in store by clicking on the button below. If you are in the United States and need a demonstrator, then you can order your supplies in my online store here. Thanks for looking! Welcome back to our Fancy Friday Blog Hop. With next Friday being Good Friday, we decided to do our blog hop a little early this month. If you are following along, you should have just arrived from visiting the lovely and talented Erica Cerwin. It wasn't difficult for me to be inspired for today's project...I love all the beautiful colors of spring and with Easter just a week away I wanted to make some treat bags to give away to family and friends. I incorporated a trick I have seen used by major manufacturers to create the closures for these fun treats. I attached the bows and tags to a white chenille stem and used that as a twist tie to close the bags. This makes it really easy for the person who receives the treat to open and close it without destroying the packaging or embellishments. The sentiment from the Apple of My Eye stamp set is perfect for these treats. I stamped it on Whisper White card stock and then punched it out with a 1-3/4" Circle Punch. Then I layered it on some coordinating DSP punched with a 2-3/8" Scallop Punch. I hope you like today's project. I can't wait to see what the other Fancy Friday team members have created. Now be sure to hop on over to visit the incredibly talented Krista Frattin. Welcome back to another 2015-16 Stampin' Up! Artisan Design Team blog hop. We are a group of international demonstrators selected by Stampin' Up! to represent the company on our blogs and on social media. If you are already going through the hop, you should have just arrived here from visiting my incredibly talented friend, Cindy Schuster. When you leave here you will travel on to visit the amazing Inge Groot. This week we are featuring the Shine On Specialty Designer Series Paper. You will be amazed at all the fabulous projects created by the Artisan Design Team so be sure to go all the way through the blog hop! One of the best things about being on the Artisan Design Team is that sometimes it challenges me to step outside of my comfort zone and try something new. I am convinced that I would have NEVER made this card had I not been asked to focus on this DSP. After, there isn't a single flower on this card (wink). It doesn't happen often, but sometimes when I have a lot going on in my life, it is difficult to focus on my stamping and paper crafting. My card just wasn't coming together and the photo was due to SU the next day. That's where my teammate and friend, Cindy Schuster came to the rescue. I kept sending her pictures and asking "what do you think of this?" You see, it is okay to get feedback from another designer, especially when you value their opinion...and Cindy is amazing! She was able to provide me with a fresh perspective and helped me see that I was trying too hard. Once I quit worrying about the deadline, I was able to relax and then it all came together into one pretty amazing card. One of the challenges of using this DSP is that it has silver metallic accents on one side and almost neon bright colors on the other. How you use it depends on your perspective. Personally, I am more of a glitz/glamour kind of gal who likes a more traditional look to my paper crafting so I opted to use the side with the silver accents. Here is a quick run down of this card. I wanted to hide the neon side of the dsp, so I created a top-folding card base with Crumb Cake cardstock and layered on the polka dot dsp. Next, I used the Sunburst Thinlits Die to cut some striped DSP and silver foil cardstock. I wanted the foil layer to peek out from behind the striped layer so I rotated the top layer about 1-2 degrees clockwise and then attached both layers to the card front with dimensionals. The die is larger than the 5.5"x4.25" card base, so I trimmed off the excess. I used the Star Framelits to cut two concentric stars from silver foil cardstock and attached those with dimensionals as well. I fussy cut some clouds from another sheet of the Shine On DSP. When the clouds straddled a gap in the sunburst, I used dimensions to add support. I stamped the word "shine" from the coordinating Sunburst Sayings stamp set and fussy cut it. Finally, I scattered some rhinestones on the front for just a bit more bling. We have a theme challenge this week over at the Global Design Project challenge blog. Let me just say that should be one of our biggest weeks because let's get real...just about anything goes as long as it is a thank you card...so if you have never played along on one of our challenges, this is definitely the week you should give it a go. One of the things we are doing at GDP this week is sending our card to someone who plays along with our challenges on a regular basis. It was really difficult for me to choose just one person, but in the end I picked Dena Rekow. Dena is so creative and funny, but the thing I like the best is that she isn't afraid to try new things. So thank you, Dena, for being a regular player over at the Global Design Project challenge blog. I don't know about you, but it has been a long winter here in Tennessee and I am ready for some warmer weather. I love all the beautiful colors of Spring that I know will be bursting forth over the next several weeks. It is probably the most beautiful time of the year here in middle Tennessee and it definitely inspired my color selection for today's card. Don't you just love those fun polka dots. The stamp is actually the cherry from the Apple of My Eye photopolymer set, but I could not resist turning it into a super fun background for this "one-layer" card. The sentiment if from the same set. Isn't this color combo just so much fun? It is Watermelon Wonder, Daffodil Delight, and Garden Green on Whisper White Heavy Cardstock. It has taken a while for me to embrace Watermelon Wonder, but now that I have, I adore it. Here is a little tip...I wanted the flower center to be a perfect match with the dots, so I stamped the peach from the stamp set with Watermelon Wonder ink and then cut the flower center from the stamped piece. The embellishments on this card are easy to create with the Botanical Builders and the Rose Garden Thinlits Dies. If you are wondering where that white twine is from...then wonder no more...it is a strand from the 1-1/4" White Jute Ribbon. It makes the most wonderful bows and it is a nice change of pace from my typical linen thread bows. Even if you don't join in, be sure to check out what the other talented designers/players have created for this fun challenge at the Global Design Project Challenge Blog. Welcome back to another 2015-16 Stampin' Up! Artisan Design Team blog hop. We are a group of international demonstrators chosen by Stampin' Up! to represent the company on our blogs and on social media. March 4th is International Scrapbooking Day, and since this is a global design team, we thought it would be fitting to focus on scrapbooking projects for this blog hop. Most of us tend to feature cards on our blogs, so this is an interesting change of pace. If you are already going through the hop, you should have just arrived here from visiting my super talented friend, Cindy Schuster. When you leave here you will travel on to visit the amazing Inge Groot. I will be the first to admit that I don't scrapbook much...probably because I just don't have a sweet, little one underfoot. I am in that stage between little children and grandchildren (and I hope to stay there for at least a few more years.) So when I need photos of beautiful little girls, I turn to my sister. She and my mother are more than happy to supply photographs of my beautiful nieces. They live a few hundred miles away, so we only get to see them a couple of times a year. This is Maggie. She is the newest addition to our family. This is the very first page of have made of her and I think I am going to be in BIG TROUBLE. I typically make digital scrapbook pages when I know I will need duplicates...but this one is the real deal. Have you ever done something with the best of intentions, only to have it come back to haunt you? What was I thinking? I know that I need to make three more of this layout...or risk being shunned from any future family outings. (Insert puppy dog eyes and violin music here!) LOL! I come from a family of seamstresses and quilters, but I have never actually made a quilt. (That is on my bucket list.) I like to joke and say that I create paper quilts. You may have already guessed that this page was a bit time consuming, but compared to a fabric quilt, it was much faster. The background is made up of 144 one inch squares of designer series paper. I wasn't sure what my final layout was going to look like, so I just decided to cover the entire 12"x12" piece of cardstock just to be safe. Yes, this was a bit of a challenge, so I have some tips that might make it easier for you to create your own. First, I narrowed down my color pallet...Rose Red, Blushing Bride, Mint Macaron, Crumb Cake, Garden Green, and Whisper White. Then I looked through my paper collection to see what I had in these colors. 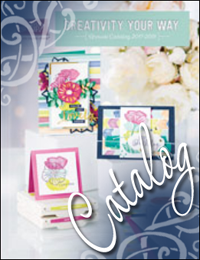 Most of the patterns are from Birthday Bouquet DSP and Love Blossoms DSP. After I selected the colors, I used a 1" square punch and got busy. I loosely arranged the squares on a piece of 12"x"12 cardstock. Once I felt good about the arrangement, I used my cell phone to snap a photo. Next, I collected each row in order from left to right. I kept each row separate by placing them in an old ice cube tray. The tray has 14 wells and this was the prefect way to keep everything organized. Next, I put several rows of tear and tape adhesive on my card base and worked two rows at a time, using my cell phone photo to help me stay on track. This allowed me to be able to take a much needed break between rows when necessary. I hate to even mention this, but I sponged Crumb Cake lightly around each square...I can hear the groans now...LOL! I think that if I were going to start over, I might use larger squares, but not too large because it may take away from the heirloom quilt feeling that I am trying to achieve. If you make it to this point, then it is smooth sailing. I layered a large piece of DSP behind the photo mat to help tone down the "busy-ness" of the layout. I die cut several flowers and leaves to help ground the corners of the photo. I also stamped and die cut the sentiment oval and words. The entire project took about eight hours to complete, but I could probably reproduce it in about 5-6 hours now that I have the design worked out. I know that is a lot of time to spend on a scrapbook page, but I consider this an heirloom page...one that will be enjoyed for years to come. I think I am going to have to find a way to at least scan the background of this page so that I don't have to start completely from scratch. If you have a favorite place to have your 12x12 scrapbook pages copied, then leave me a comment below...please! Tags: Artisan Design Team, International Scrapbooking Day, Stampin' Up!